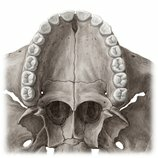 Teeth - want to learn more about it? The tooth anatomy is an interesting but challenging topic that demands the respect of any health science student or professional. The human teeth are quite special because they grow twice during an adult’s lifespan, are essential structures for the mechanical digestion of food, and support certain facial features. In this page, we are going to study each one of the above types, learn how they are numbered, and understand the various anatomical parts of teeth. There are thirty-two teeth in total in the oral cavity of an adult with a healthy dentition. One half, or sixteen, are embedded in the maxilla, while the lower half are situated within the mandible. The name of teeth on each arcade is self-explanatory - the top sixteen are named ‘maxillary teeth’, while the bottom half are named ‘mandibular teeth’. Each arcade is a mirror of its counterpart, containing corresponding teeth types. Tackle the following quiz to learn the names of teeth. For simplification purposes, dental professionals use numbering systems to identify the various teeth. The teeth are numbered 1 to 32; superior right to left, then inferior left to right. Watch the following teeth video to find out more about the four groups and their numbering. In addition to the specific naming and numbering, dental anatomy is also unique in the possible types of teeth and their respective numbers. Children have twenty teeth, called deciduous or milk teeth, between six months and six years of age. This set is subsequently replaced by the permanent dentition of thirty-two teeth in adolescence and adulthood. Read the following articles to find out more details about the two types of human teeth. The blood supply of the teeth originates from the maxillary artery, which is the largest terminal branch of the external carotid artery. It is responsible for supplying the deep structures of the face. The veins of the teeth follow the arteries, having similar names. They drain into the pterygoid plexus or the facial vein.